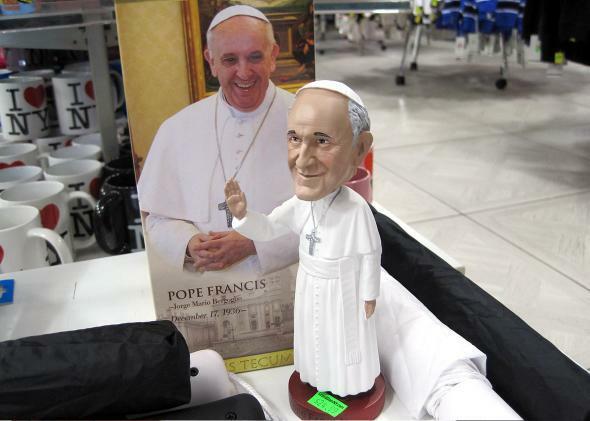 Pope Francis swag: All the papal souvenirs you can buy, from bobbleheads to buttons to cardboard pope faces. Francis’ visit has inspired a cottage industry of papal buttons, baseball caps, and bobbleheads. Pope Francis is given a pope doll as he greets well-wishes after arriving at John F. Kennedy International Airport on Sept. 24, 2015, in New York. The Catholic Church banned the sale of indulgences in 1567, but American Catholics looking to spend their money on other kinds of godly souvenirs have had plenty of options this week. Pope Francis’ whirlwind tour of the United States has inspired an accompanying flurry of commercial activity. To mark the historic visit, street vendors are stocking pope shirts, pope hats, pope bracelets, and pope bobbleheads. There is pope cheese that can be spread on pope toast, then washed down with a sampling of pope beers. 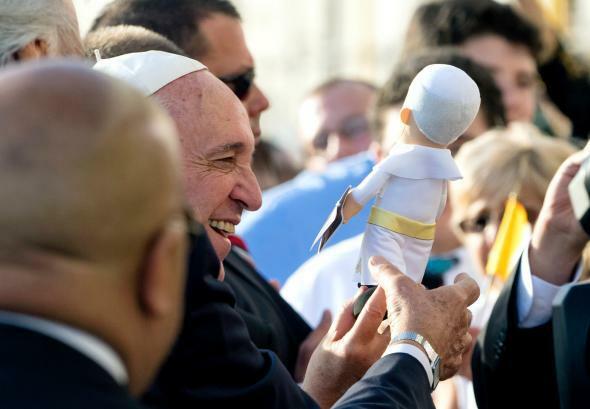 Upon arriving at New York’s John F. Kennedy Airport on Thursday evening, Francis was gifted, to his apparent delight, a friendly-looking pope doll. That evening, as crowds shuffled along Manhattan’s Sixth Avenue straining to glimpse the cordoned-off St. Patrick’s Cathedral, where the pontiff was leading a private evening prayer, merchants lined the sidewalks. The most enterprising among them have formed a sort of secondary entourage for the pope’s visit, booking tickets from Washington to New York to Philadelphia to hawk their goods. They’ve loaded up on posters, buttons, and flags large and small. But despite their entrepreneurial fervor, the economy for pope swag has been lackluster. 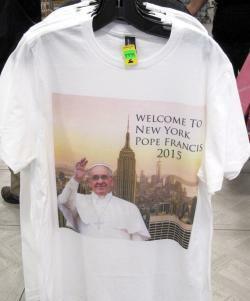 A Pope Francis T-shirt on display at Grand Slam in Times Square in New York City. Sharieff, a 52-year-old street vendor who declined to give his last name, expresses similar concerns from the corner of 44th Street and Seventh Avenue. 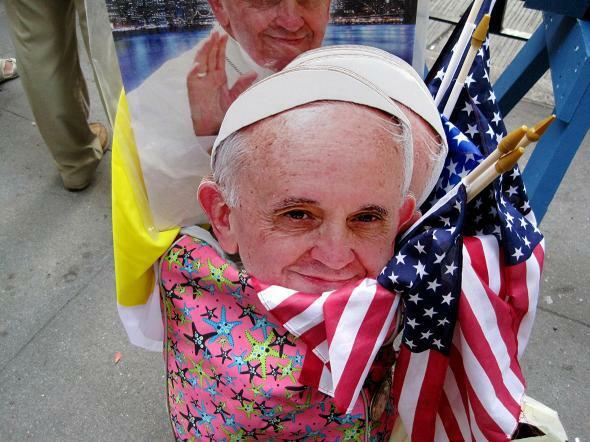 He’s purchased about two-dozen brightly colored caps, splashed across with “POPE FRANCIS IN U.S.A,” and has lined them up alongside the standard “NEW YORK” ones. If Sharieff sells out of those, he’ll invest in more, but the pope is only here for two days, and so far sales have been weak. “It’s all reporters!” he says—four of us, apparently, as opposed to zero paying customers. Encouraged by my editor, I say I’m interested in buying a hat, depending on the price. He wants $10. I suggest $7. We settle on $8, and I leave with a pink one. The pink hat was purchased by Slate’s Moneybox. 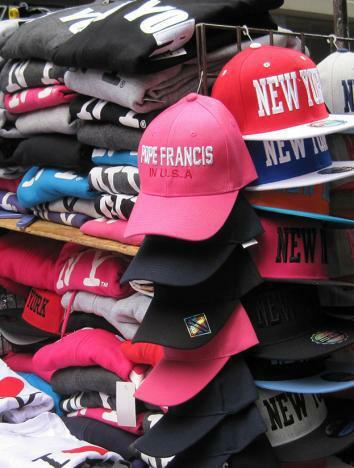 In New York, most of the pope paraphernalia you see on the streets has come by way of wholesale vendors located around 28th Street and Broadway who procured it straight from manufacturers in China. Wholesaler Roots & Culture Inc. had ordered about 600 T-shirts, as well as some posters, buttons, and key chains. The buttons, adorned with various genial-looking images of Francis and priced at $6 for a dozen, are proving most popular. “It’s a small thing you can wear, and it’s cheap,” the manager, Silvia, says. Next door at Triple Double, owner Jay Shin is carrying buttons, key chains, and bracelets, also for $6 a dozen. The volume was fairly low, at about 30 dozen, but he tells me that vendors have been requesting it. When I ask Shin whether he thinks he’ll make money off the papal visit, he scrunches up his nose and shakes his head. A Pope Francis bobblehead on display at Grand Slam in Times Square in New York City. If there’s one winner of pope-apalooza, it’s Warren Royal, owner of Royal Bobbles, the Georgia-based company behind the popular Pope Francis bobblehead. Buoyed by a wave of press, Royal had by late August sold nearly 10,000 of them, and as of this week, he’s produced an estimated 25,000, some of which are still on order with his manufacturer in China. “It has become a kind of pop culture thing,” he told the Los Angeles Times. Royal has said he retails them for $20 to $25, meaning stores like I ♥ New York Gifts are making a tidy profit off their markups. As Francis continues his second day in New York on Friday, his merchant cortège is doubtless filling the streets once more. Some, like Sharieff, are in the souvenirs business full-time, while others, like Manuel Quilli of Queens, have set up specially for the occasion. At his spot on Sixth Avenue and 48th Street on Thursday evening, Quilli shows me the shirts and flags he’s offering for $7 to $10. Only a handful had been bought so far, but he tells me he plans to stake out space near Madison Square Garden on Friday, hoping more will go then. One block up, Harlem resident Sharon is similarly optimistic. She’d just come from Washington, where she estimates that she sold about 500 pieces of merchandise, and is headed to Philly next. A life-size cardboard cutout of Pope Francis’ head, yours for $10. Read more of Slate’s coverage of Pope Fracis’ U.S. visit.